Welcome back to Midweek Madness, for which we read the tabloid "news" so you don't have to! 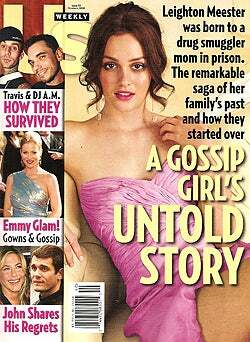 This week, Us brings you the "untold" story about Gossip Girl's Leighton Meester's crazy criminal family, most of which was in Star magazine back on September 3. (It's still juicy stuff!) Star's cover story is about poor little rich girl Suri Cruise and her desolate, stuffed-animal filled but playmate-lacking life. For reasons we cannot fathom, OK! decided to delve deep into the diet and workout regimen of Kim Kardashian. And it was all downhill from there. Intern Margaret assists as we head to the crapper and flip through the pages of OK!, In Touch, Star, Life & Style and Us, after the jump.